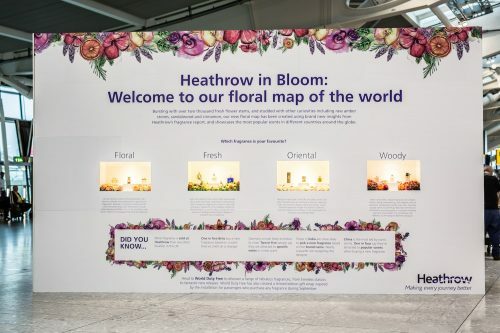 In order to communicate Heathrow Airport’s new global fragrance report which highlights purchasing trends of passengers travelling throughout Heathrow and wider fragrance behaviours from across the world, they commissioned us to create the world…from flowers! 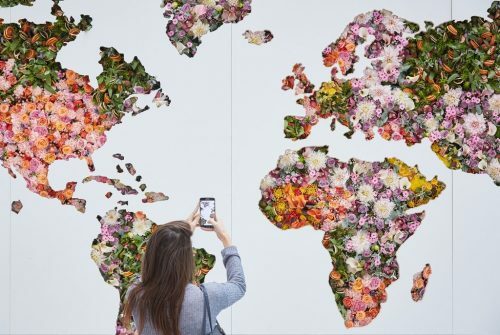 The impressive installation which measured over 6m wide and featured over 2,000 fresh fragrant flower stems offers a unique insight into the four key fragrance notes of the new Autumn/Winter season: woody, fresh, oriental & floral alongside fragrance preferences from around the globe. Each country in the map accurately depicted the fresh scents that feature in the most beloved fragrances of different nations. 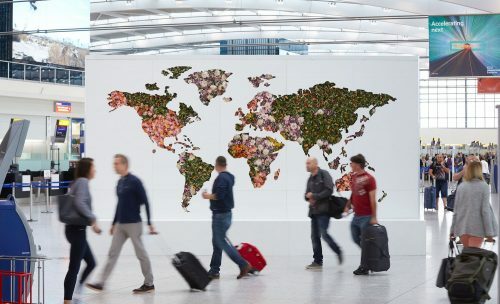 Inspired by Heathrow Airports initial concepts, our designers created a watercolour of the installation which was later transformed into gift wrap packaging & POS artwork in the World Duty Free stores at Heathrow. 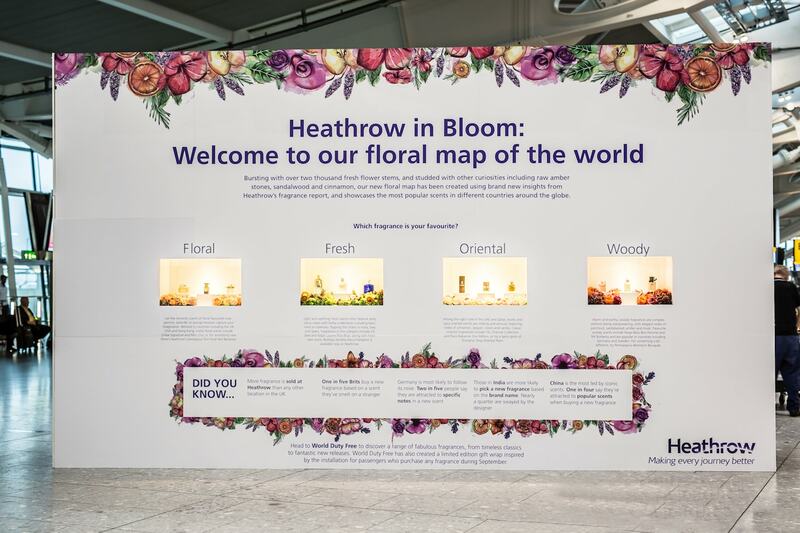 When passengers purchased one of 12 showcased fragrances, these were wrapped in our paper design to further communicate the brand message. The reverse of this incredible structure featured a custom-created vinyl which communicated the details of this project to passengers. Viewing windows were then incorporated to showcase 12 designer fragrances and allow for further passenger engagement. 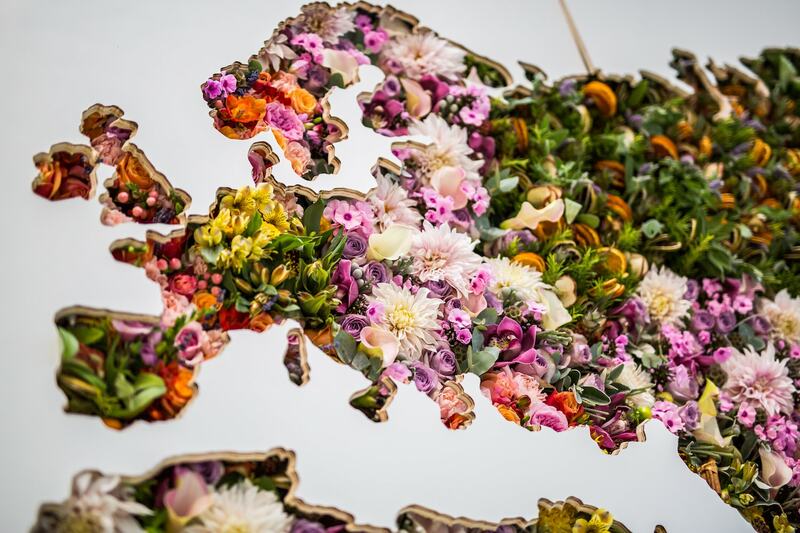 Our team designed each element of this spectacular installation, from the structural core to the floral embellishment. By controlling the full design process and using our team of experienced craftsmen, we ensured the brand message and overall concept was consistently communicated.